We characterized a new pathway to induce tolerogenic dendritic cells (DCs) following treatment of human monocyte-derived DCs with proteases from the fungus Aspergillus oryzae (ASP). ASP-treated DCs (ASP-DCs) exhibit a CD80−CD83−CD86−Ig-like transcript (ILT)2−ILT3−ILT4+ phenotype, do not secrete cytokines or chemokines, and express tolerogenic markers such as glucocorticoid-induced leucine zipper, NO synthetase-2, retinaldehyde dehydrogenase-1 or retinaldehyde dehydrogenase-2. When cocultured with naive CD4+ T cells, ASP-DCs induce an anergic state that can be reversed by IL-2. Generated T cells mediate a suppressive activity in third-party experiments that is not mediated by soluble factors. A comparison between dexamethasone-treated DCs used as a reference for regulatory T cell-inducing DCs and ASP-DCs reveals two distinct phenotypes. In contrast to dexamethasone, ASP treatment induces glucocorticoid-induced leucine zipper independently of glucocorticoid receptor engagement and leads to NF-κB p65 degradation. 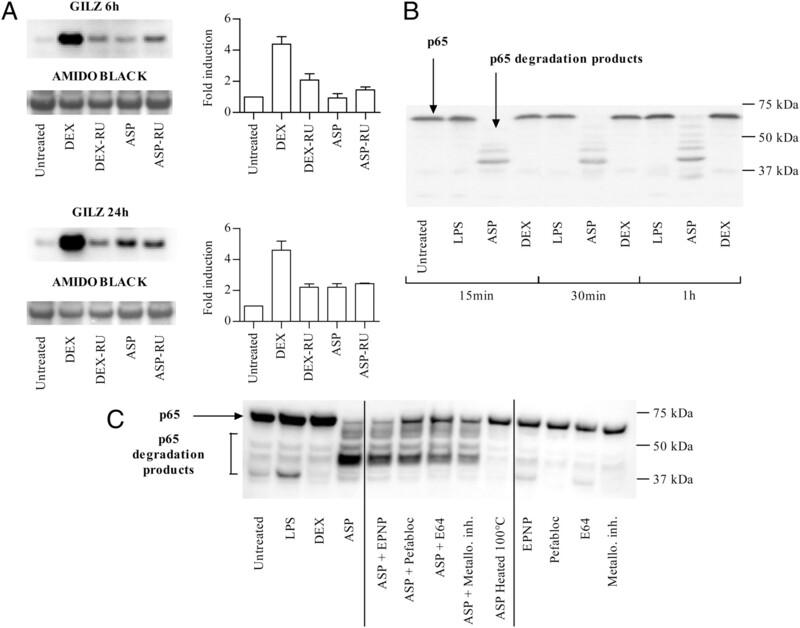 Abrogation of protease activities in ASP using specific inhibitors reveals that aspartic acid-containing proteases are key inducers of regulatory genes, whereas serine, cysteine, and metalloproteases contribute to NF-κB p65 degradation. Collectively, those features correspond to a previously unreported anergizing phenotype for human DCs. Such regulatory mechanisms may allow fungi to downregulate host immune responses and provide clues for new approaches to treat proinflammatory disorders. Dendritic cells (DCs) are specialized APCs playing a pivotal role in the induction of both immunity and tolerance (1). Depending upon the type of pathogen encountered and the profile of costimulatory and T cell-polarizing molecules engaged, DCs drive the development of Th1, Th2, Th17 effector, or suppressive/regulatory T cells (2–7). Regulatory T cell (Treg) generation is currently considered as a potential treatment for autoimmune diseases (8), graft-versus-host disease (9–11), or allergy (12, 13). Thus, the induction of tolerogenic DCs supporting suppressive T cell responses while downregulating effector responses can be considered as an approach to control a variety of inflammatory disorders. Several studies have demonstrated that Treg-promoting DCs can be generated in vitro following treatment with biological (e.g., IL-10, TGF-β) or pharmacological agents (recently reviewed in Ref. 14). Most particularly, DCs conditioned with dexamethasone (DEX-DCs) present a semimature phenotype and prevent the upregulation of costimulatory molecules as well as the secretion of proinflammatory cytokines like IL-12 (15–17). Such DEX-DCs inhibit the proliferation of allospecific T cells (18, 19), prolong allograft survival in mice (20), and decrease the number of IFN-γ–producing CD4+ T cells, but support the differentiation of IL-10–producing type 1 Tregs (Tr1) (15, 21, 22). Besides their capacity to elicit suppressive T cells, tolerogenic DCs are commonly defined based on the expression of various surface markers such as Ig-like transcript (ILT) molecules (4, 23–28), transcriptional regulators like glucocorticoid-induced leucine zipper (GILZ) (29–31), or enzymes such as retinaldehyde dehydrogenase (RALDH) (32–36) or NO synthetase-2 (NOS-2) (37), all contributing to their functional properties. In this study, we describe a new pathway to induce tolerogenic DCs following treatment with proteases from the Aspergillus oryzae fungus. A. oryzae is used for the production of traditional fermented food such as soy products as well as enzymes, antibiotics, beverages, and volatile compounds (38). In this study, we demonstrate that protease from A. oryzae (ASP)-DCs exhibit a tolerogenic phenotype distinct from other conventional regulatory DCs such as DEX-DCs. ASP is a protease–peptidase complex produced by submerged fermentation of A. oryzae, which contains both endoprotease and exopeptidase activities (Sigma-Aldrich, St. Louis, MO). This product complies with the recommended purity specifications for food-grade enzymes issued by the Joint Food and Agriculture Organization/World Health Organization Expert Committee on Food Additives and the Food Chemicals Codex. In selected experiments, culture supernatants were filtered through 10-kDa cutoff filters (Amicon; Millipore, Billerica, MA) to remove small molecules. Human PBMCs were separated out of buffy coats obtained from healthy volunteers (Etablissement Français du Sang, Rungis, France) by centrifugation over a Ficoll-Paque plus gradient (PAA Laboratories, Les Mureaux, France). To generate monocyte-derived DCs, 5 × 108–8 × 108 cells were cultured at 37°C, 5% CO2, in RPMI 1640 medium with stable glutamine supplemented with 10 μg/ml gentamicin, 50 μM 2-ME, 1% nonessential amino acids (all obtained from Invitrogen, Carlsbad, CA), and 10% FCS (Gentaur, Brussels, Belgium). After 1 h, nonadherent cells were removed, and adherent cells were further cultivated for 6 d in presence of human rGM-CSF and rIL-4 (Gentaur) using 100 and 50 ng/ml concentrations, respectively. After 6 d, a pure population of DCs was obtained, with >95% CD14− CD1a+ cells detected by flow cytometry using a FC500 cytometer and the CXP analysis software (Beckman Coulter, Villepinte, France). Up to 106 DCs were plated in a 24-well plate in presence of medium, ASP (0.2–20 μg/ml), DEX (1 μg/ml [2.5 μM]; Sigma-Aldrich), or highly purified LPS from Escherichia coli (1 μg/ml; InvivoGen, Toulouse, France) for 24 h at 37°C and 5% CO2. In some experiments, LPS and DEX or ASP were added together. For signaling experiments, RU-486 (kind gift of Michel Renoir) was added to the culture at a 1 μM concentration. For immunofluorescence staining, cells were harvested, washed in PBS, and incubated for 20 min at 4°C with the following mAbs: FITC anti-CD80, PE anti-CD86, PE–cyanin-5 anti-CD83 (Beckman Coulter), FITC anti-ILT2, PE anti-ILT4, and PE–cyanin-5 anti-ILT3 (R&D Systems, Lille, France). Cells were stained with corresponding isotype-matched control mAbs. Samples were analyzed by flow cytometry with results expressed as mean variations in percentages of positive cells. Cytokine measurement was performed in supernatants using the cytometric bead array technology. IFN-γ, IL-1β, IL-2, IL-6, IL-8, IL-9, IL-10, IL-12p70, IL-13, IL-17A, and TNF-α were measured using the Human Inflammatory CBA kit or CBA Flex sets (BD Biosciences, Le Pont de Claix, France) and analyzed by flow cytometry according to the manufacturer’s instructions using an FACSArray instrument and the FCAP Software (BD Biosciences). Chemokine release was measured in DCs supernatants using Duoset ELISA kits (R&D Systems) for CCL-1, CXCL-10, CXCL-12, CCL-17, CCL-19, CCL-20, CCL-21, and CCL-22 according to the manufacturer’s instructions. Total RNA was extracted from DCs after a 24-h treatment (unless otherwise specified) using the RNeasy Mini kit (Qiagen, Courtaboeuf, France), and cDNAs were synthesized using TaqMan reverse transcription reagents (Applied Biosystems, Les Ulis, France) as per the manufacturer’s instructions. mRNA expression was evaluated by quantitative PCR on a 7900HT Real-Time PCR system (Applied Biosystems) with predesigned TaqMan gene expression assays and reagents, according to the manufacturer’s instructions. Expression of the following genes was assessed in DCs: GILZ (Hs00608272_m1), IDO (Hs00158032_m1), NOS-2 (Hs00167248_m1), RALDH-1 (Hs00167445_m1), and RALDH-2 (Hs00180254_m1). Data were interpreted for each target gene in comparison with endogenous β-actin (Hs99999903_m1) as a control. The relative amount of target genes in each sample was calculated in comparison with the calibrator sample using the ΔΔ cycle threshold (Ct) method. The magnitude of gene induction was calculated using the equation 2−ΔΔCt = 2−(ΔCt for stimulated cells − ΔCt for unstimulated cells). For DC/T coculture experiments, treated DCs were washed twice with medium and cultured in a 24-well plate with allogeneic CD4+ naive T cells at a 1:10 DC/T ratio for 5 d. Naive CD4+ T cells were isolated from PBMCs by negative selection using the MACS naive CD4 isolation kit II (Miltenyi Biotec, Paris, France), according to the manufacturer’s instructions. Such naive T cells were confirmed to be >95% pure based on CD3, CD4, and CD45RA expression evaluated by flow cytometry. Supernatants were analyzed for cytokine release as described earlier. FOXP3 expression was assessed on cocultured T cells after fixation, permeabilization, and staining using a FOXP3 staining kit (eBioscience, San Diego, CA). For measurement of anergy induced in cocultured T cells, CD4+ T cells were isolated using a Dynal negative CD4+ T cell isolation kit (Invitrogen) and cultured 2 d in medium (resting state). T cells were CFSE labeled (Invitrogen) and restimulated with medium, IL-2 (1000 U/ml; Roche Applied Science, Meylan, France), anti-CD2, -CD3, and -CD28 beads (using one bead per two cells; Miltenyi Biotec), or both during 3 d. Percentages of CFSE-proliferating T cells were assessed by flow cytometry. To assess potential apoptosis, DCs or T cells were stained with the Vybrant apoptosis kit (Invitrogen) using Annexin V-FITC and propidium iodide (PI) as per the manufacturer’s recommendations. Dinitrochlorobenzene (DNCB; Sigma-Aldrich) at a 500 μM concentration was used as a positive control for apoptosis and necrosis induction as suggested by others (39, 40). CD4+CD25− responder cells were isolated using the MACS CD4+ CD25+ regulatory T cell isolation kit (Miltenyi Biotec) through collection of the negative fraction. Cells were CFSE labeled and plated with anti-CD2, -CD3, and -CD28 beads (ratio 1:1). Cocultured T cells were added at various ratios ranging from 1:2 to 8:1 responder/cocultured T cells and further incubated for 3 d. As negative controls, responder cells and cocultured cells were cultured alone with or without anti-CD2, -CD3, and -CD28 beads. All dilution series were carried out in duplicate, and responder cell proliferation was assessed by flow cytometry. Impact of soluble factors on T cell suppression was analyzed by incubating CFSE-labeled CD4+ T cells stimulated with anti-CD2, -CD3, and -CD28 beads with 4, 20, or 100 μl supernatant from treated DCs/T cells cocultures. Percentages of proliferating cells were determined after 5 d by flow cytometry. Cultured DCs (2 × 106 cells/condition) were washed in cold PBS three times before lysis in 50 μl lysis buffer (20 mM Tris [pH 7.4], 137 mM NaCl, 2 mM EDTA [pH 7.4], 1% Triton, 25 mM β-glycerophosphate, 1 mM sodium vanadate, 2 mM sodium pyrophosphate, 10% glycerol, 1 mM PMSF, 10 μg/ml aprotinin, and 10 μg/ml leupeptin, all purchased from Sigma-Aldrich). Homogenates were centrifuged at 15,000 rpm for 20 min at 4°C and supernatants collected. Protein concentration was determined by the Bradford method (protein assay; Bio-Rad, Marnes-la-Coquette, France), and equal amounts of denatured proteins were loaded onto an SDS-PAGE gel and transferred to a polyvinylidene difluoride membrane (Invitrogen). After a 1 h blocking step with TBS containing 3% BSA, membranes were incubated with either rabbit polyclonal Abs raised against GILZ (41) or a rabbit anti-p65 subunit of NF-κB mAb (Santa Cruz Biotechnology, Santa Cruz, CA). Using an HRP-conjugated anti-rabbit secondary Ab (Jackson ImmunoResearch Laboratories, Baltimore, MD), immunoreactive bands were detected by chemiluminescence (SuperSignal West Pico; Fisher Scientific, Illkirch, France). Membranes were stripped (ReBlot Plus Mild Ab Stripping Solution; Millipore) and reprobed with an mAb against β-tubulin (Sigma-Aldrich) as loading control or stained with amidoblack (Sigma-Aldrich). Band intensity was determined using Bio1D software (Vilber Lourmat, Marnes-La-Vallée, France). ASP was incubated with protease inhibitors for 1 h prior to incubation with DCs or heat inactivated at 100°C for 15 min. Specific inhibitors used included a mix of metalloprotease inhibitors, the serine protease inhibitor Pefabloc SC (4 mM; Roche Applied Science), the cysteine protease inhibitor E64 (12 μM; Roche Applied Science), and the aspartic protease inhibitor 1,2-epoxy-3-(p-nitrophenoxy)propane (EPNP; 9 mM; Acros Organics, Gell, Belgium). Data are expressed as mean ± SEM. Statistical differences between groups were assessed using the multiple comparison, nonparametric Kruskall–Wallis test. Treatments were compared with controls (unless stated otherwise), and p < 0.05 and p < 0.01 were considered significant. Statistical and graphical analyses were performed using Prism 5 software (GraphPad, La Jolla, CA). We first investigated the effect of ASP on the expression of costimulatory (CD80, CD83, CD86) or inhibitory receptors (ILT2, ILT3, ILT4) in monocyte-derived DCs (Fig. 1A). DCs cultured with medium, LPS, or DEX were used as controls. Combinations of LPS and DEX or ASP were also tested to detect potential cross-inhibitory effects of those molecules. As expected, LPS increased surface expression of CD80, CD83, and CD86 molecules, whereas DEX had no significant effect on the basal expression of these molecules. ASP induced a complete inhibition of CD80 expression on DCs. Regarding inhibitory molecules, DEX-DCs upregulated ILT2, whereas ASP-DCs rather expressed ILT4 while losing surface expression of ILT2 and ILT3. When tested in combination with LPS, DEX did not induce any changes in surface expression of such molecules when compared with LPS alone. In contrast, LPS-ASP-DCs exhibited a phenotype similar to ASP-DCs (i.e., CD80−CD83lowCD86lowILT2−ILT3−ILT4+), indicating a dramatic antimaturation effect. We next monitored cytokine and chemokine secretion by treated DCs. 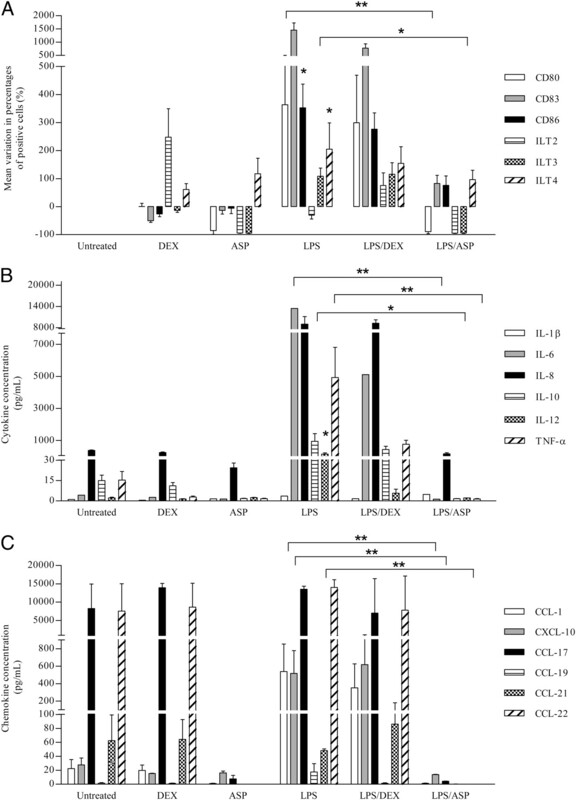 LPS induced IL-6, IL-8, IL-10, IL-12p70, TNF-α, CCL-1, and CXCL-10 production by DCs, whereas DEX did not induce any of these molecules in comparison with untreated DCs (Fig. 1B, 1C). ASP-DCs did not secrete cytokines or chemokines (with the exception of 25 pg/ml IL-8) and even showed a reduced basal secretion of IL-10, TNF-α, CCL-17, CCL-21, and CCL-22. The inhibitory effect of ASP was also confirmed on cytokine and chemokine expression because LPS-ASP-DCs secreted substantially less of those molecules when compared with LPS-DCs (Fig. 1B, 1C). The expression of various genes involved in the induction of suppressive responses was quantified by real-time PCR after incubation of DCs with LPS, DEX, or ASP (Fig. 2A) for 24 h and compared with DCs incubated in medium alone. As expected, LPS did not induce GILZ, NOS-2, or RALDH-1/2 gene expression in DCs but significantly upregulated IDO. DEX slightly induced NOS-2, RALDH-1, and IDO but markedly increased GILZ gene expression. ASP increased GILZ, NOS-2, RALDH-1, RALDH-2, but also IDO gene expression in a dose-dependent manner, thus leading to a tolerogenic phenotype distinct from DEX-DCs. We further compared the kinetics of gene expression within 1–48 h following treatment with either DEX or ASP (Fig. 2B, 2C). DEX treatment induced an early and rapid upregulation of GILZ, beginning 1 h after treatment, whereas GILZ was induced only 16 h after ASP treatment. RALDH-2 was also significantly upregulated following ASP treatment, and the latter also induced an earlier and much stronger expression of RALDH-1 when compared with DEX treatment. Collectively, those experiments indicate that ASP-DCs exhibit a tolerogenic phenotype distinct from regulatory DEX-DCs. Because apoptotic DCs have been shown to induce tolerance (42, 43), we investigated whether ASP treatment induces DC apoptosis. DCs were treated with LPS, DEX, ASP, or DNCB (500 μM) as a positive control for 24 h. Annexin V/PI staining indicated that, in contrast to DEX, ASP rather reduces apoptosis and necrosis of DCs (Fig. 3A, 3B). Thus, tolerance induction by ASP-DCs is not due to apoptosis induction. We next analyzed the polarization of naive allogeneic CD4+ T cells after coculture with treated DCs. To this aim, DCs were first incubated for 24 h with LPS, DEX, or ASP, then washed and cocultured with CD4+ T cells. Th cell polarization was monitored after 5 d by measuring cytokine levels in culture supernatants (Fig. 4A). As expected, LPS and DEX-DCs induced IFN-γ and IL-10 production by T cells, respectively. In contrast, ASP-DCs markedly decreased the secretion of most cytokines tested (i.e., IFN-γ, IL-9, IL-10, and IL-13) when compared with control CD4+ T cells. TGF-β secretion was slightly increased in ASP-DC/T cell cocultures (Fig. 4B), but this variation was not statistically significant. To analyze the impact of ASP-DCs on Treg generation, we monitored FOXP3 intracellular expression in CD4+ T cells after 4 d of coculture. As shown in Fig. 4C, no FOXP3 was detected in T cells incubated with DCs treated with either DEX or ASP. Thus, ASP-DCs support the differentiation of CD4+ T cells that do not express FOXP3, whereas T cells induced by DEX-DCs produce IL-10. To investigate the functionality of CD4+ T cells differentiated in presence of ASP-DCs, we quantified IL-2 secretion by cocultured T cells and restimulated them after a resting period of 2 d, with IL-2, a polyclonal stimulus (i.e., anti-CD2, -CD3, and -CD28 beads), or both to assess whether T cells were anergic. T cells generated after control or LPS-DCs exposure secreted IL-2 (data not shown) and proliferated in response to all stimuli tested (Fig. 5). In contrast, T cells cocultured with DEX-DCs or ASP-DCs did not secrete IL-2 (not shown) and exhibited a lower proliferation following polyclonal stimulation. Interestingly, whereas DEX-DCs induced a nonreversible anergy, the anergic state of T cells cocultured with ASP-DCs could be reversed by IL-2 supplementation. 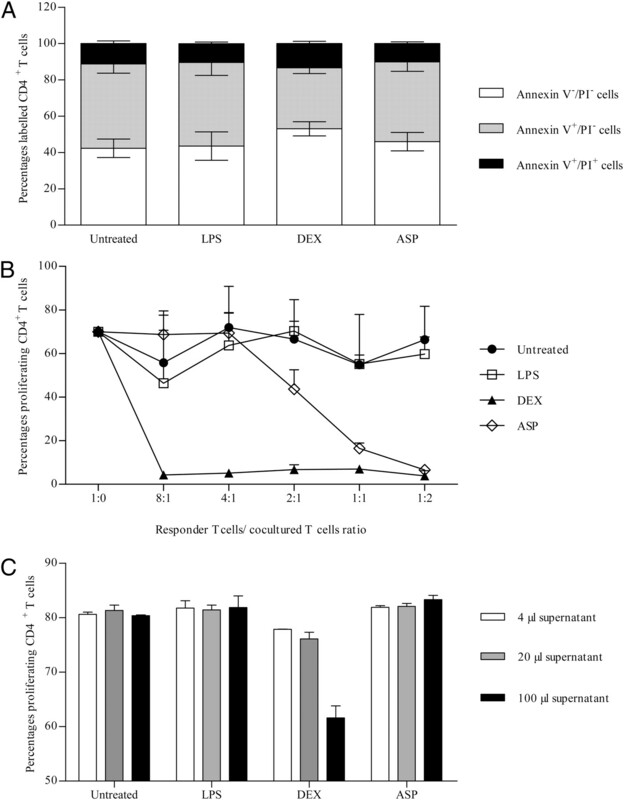 The T cell unresponsiveness induced by ASP-DCs or DEX-DCs was not due to apoptosis because none of the treatments tested changed significantly the relative proportion of early apoptotic (Annexin V+PI−) and dead cells (Annexin V+PI+) when compared with T cells cocultured with untreated DCs (Fig. 6A). To determine the suppressive capacity of T cells generated by ASP-DCs, the proliferation of responder CD4+CD25− cells was assessed following polyclonal restimulation in the presence of varying ratios of purified cocultured T cells. As shown in Fig. 6B, ASP treatment induced T cells which inhibited responder T cell proliferation at a ratio of 2:1 responder/cocultured cells and below. In comparison, DEX-DCs induced suppressive T cells inhibiting responder T cell proliferation at every ratio tested. Thus, ASP-DCs induce suppressive T cells with a reversible anergic phenotype in contrast to DEX-DCs, which rather promote the differentiation of strongly suppressive T cells with an established anergic phenotype. To further evaluate mechanisms involved in this suppressive effect, CFSE-labeled CD4+ T cells stimulated with anti-CD2, -CD3, and -CD28 beads were incubated with conditioned medium from various DC/T cocultures. As shown in Fig. 6C, supernatants from DEX-DC/T cell cocultures inhibit T cell proliferation, whereas ASP-DC/T cell coculture supernatants had no effect. 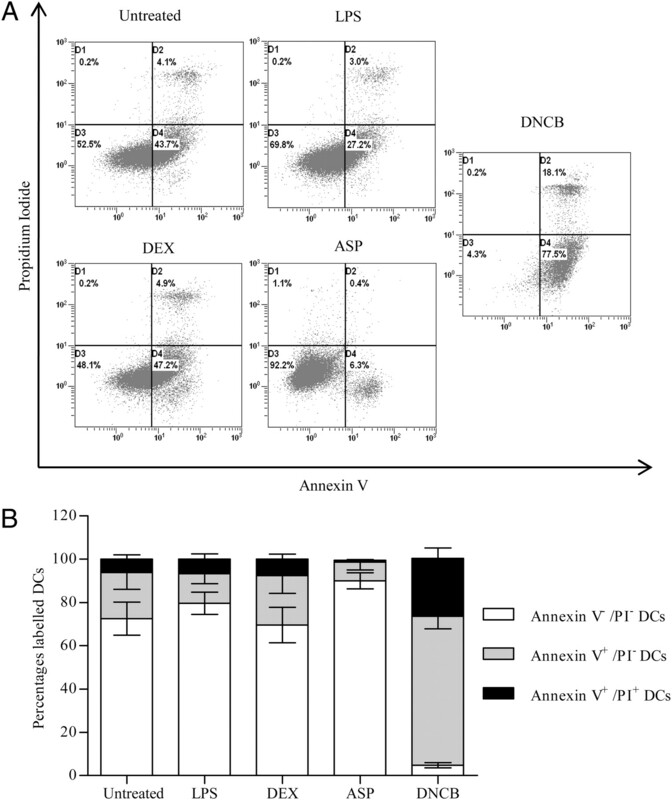 These results confirm that in contrast to Tr1s induced by DEX-DCs, the suppressive effect of T cells generated by ASP-DCs is not mediated by soluble factors. We subsequently investigated which components of ASP were responsible for the observed tolerogenic effect in DCs. In a first set of experiments, we tested whether small molecules from ASP were potentially involved in the induction of regulatory genes. ASP samples were filtered through 10 kDa cutoff filters, and both the filtrate and retentate were incubated with DCs for 24 h prior to measuring GILZ, NOS-2, RALDH-1, and RALDH-2 gene expression. As shown in Fig. 7A, the filtrate did not induce any of the tested genes, whereas the retentate had a preserved capacity to induce GILZ, NOS-2, RALDH-1, and RALDH-2 genes, demonstrating that small molecules (<10 kDa) were not involved in the induction of regulatory genes. DCs were subsequently treated with ASP, for which protease activity had been inactivated by heat (100°C for 15 min) as a positive control or by specific protease inhibitors. Preincubation of ASP with metallo-, serine, or cysteine protease inhibitors did not prevent the induction of regulatory genes (Fig. 7B). In contrast, the aspartic acid protease inhibitor EPNP completely inhibited RALDH-2 and partially GILZ, NOS-2, and RALDH-1 gene expression. 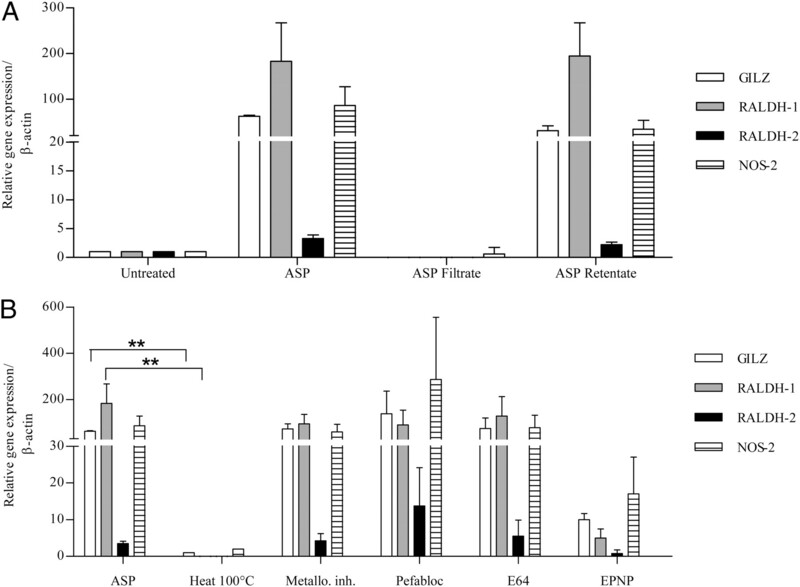 Together, these results demonstrate that aspartic acid-containing proteases from A. oryzae are critical for the induction of regulatory genes. To further document that distinct molecular mechanisms underlie the induction of tolerogenic DCs following DEX or ASP treatment, we compared GILZ induction in ASP-DCs and DEX-DCs in presence or absence of RU-486, a known glucocorticoid receptor (GR) inhibitor. As shown in Fig. 8A, RU-486 significantly inhibited GILZ expression in DEX-DCs but had no impact on GILZ expression in ASP-DCs, indicating that GILZ was induced by a GR-independent pathway in ASP-DCs in contrast to DEX-DCs. These data also confirmed that GILZ was induced later, not only at a transcriptional but also at a protein level in ASP-DCs when compared with DEX-DCs. We subsequently investigated a potential involvement of the NF-κB pathway in ASP-mediated tolerance. Although we did not see any change in IκB expression in ASP-DCs, we could demonstrate that ASP inhibits LPS-induced NF-κB translocation (not shown). We also observed an early degradation of p65 (i.e., within 15 min) in ASP-DCs but not in DEX-DCs (Fig. 8B), suggesting that ASP treatment may inhibit the NF-κB pathway in a distinct manner. To investigate which proteases were potentially responsible for p65 degradation, we incubated ASP-DCs with specific protease inhibitors. Surprisingly, aspartic acid protease inhibitor did not prevent p65 degradation in contrast to serine, cysteine, and metalloprotease inhibitors, as shown in Fig. 8C. As a control, heat-inactivated ASP completely prevented p65 degradation in DCs. Collectively, these results indicate that proteases from ASP may synergize to induce tolerance, with aspartic acid-containing proteases inducing regulatory genes and serine, cysteine, and metalloproteases contributing to p65 degradation. Tolerogenic DCs are physiologically important because they can induce Tregs, preventing or controlling autoimmunity, allergy, and graft rejection (8–13). As of today, various conditioning strategies are being considered to generate tolerogenic DCs. This includes DC treatment with anti-inflammatory cytokines (IL-10, TGF-β) (4, 44, 45), neuropeptides (46, 47), immunosuppressive drugs (e.g., dexamethasone, mitomycin C, rapamycin) (16, 19, 48, 49), or vitamins (1,25-dihydroxy-vitamin D3, vitamin A) (16, 17, 35, 50, 51). Genetic engineering of DCs has also been used to enhance the expression of IL-10 (52), TGF-β (53), soluble TNFR (54), intracellular CTLA-4 (55), or FOXP3 molecules (56) or to prevent activation of the NF-κB pathway (57). In this study, we identified a new pathway to induce tolerogenic DCs by treating monocyte derived-DCs with proteases from A. oryzae, a fungus commonly used to produce traditional fermented food, enzymes, antibiotics, beverages, and volatile compounds (16). Our results demonstrate that treatment with ASP induces DCs with a CD80−CD83−CD86−ILT2−ILT3−ILT4+ phenotype, which do not secrete cytokines or chemokines and upregulate well- known tolerogenic markers such as GILZ (29, 30), IDO (58–60), NOS-2 (61, 62), RALDH-1, or RALDH-2 (35, 51, 63, 64). ASP-DCs are clearly different from DEX-DCs because the latter promote the generation of anergic IL-10–producing Tr1s with a suppressive activity partially mediated by soluble factors, in agreement with the literature (15, 16). In contrast, ASP-DCs rather induce anergic suppressive CD4+ T cells, which do not express FOXP3 or secrete IL-10, but secrete low amounts of TGF-β. Importantly, the suppressive effect of such T cells could not be correlated with the production of soluble factors. Inhibition studies further highlighted the involvement of various proteases within ASP in the induction of regulatory properties in DCs. Our results are in agreement with other studies suggesting a potential tolerogenic role of Aspergillus-derived molecules. Aspergillus infection was reported to induce the generation of IDO+ tolerogenic DCs promoting the local recruitment of CD4+ CD25+ Tregs (65). These cells suppressed Th2 responses to the fungus through the combined action of IL-10 and CTLA-4, suggesting that such regulatory mechanisms operating at the level of DCs may be used by fungi to dampen host immune responses and induce a state of immune tolerance (65). In support of this hypothesis, we observed that culture supernatants from other Aspergillus strains such as A. fumigatus or A. niger also induce a regulatory DC phenotype (not shown). Interestingly, various A. fumigatus components have been shown by others to exhibit dramatically different immunomodulatory properties. For example, secreted proteins induce Th2 cell activation, glycolipids Th17 responses, membrane proteins mixed Th1/Treg responses, and polysaccharides mostly stimulate IL-10 production (66). Among those molecules, a protease has been shown to induce Th1/Treg responses in murine and human immune cells (66). Live A. fumigatus was also shown to downregulate the proinflammatory function of mouse airway DCs exposed to mite allergens (67). In contrast, other studies rather suggested that ASP treatment leads to partially matured DCs, driving a Th2 cell polarization with IL-4 and IL-5 production (68) and allergic lung inflammation in mice (69). Reasons for these discrepancies are presently unclear but could be due to fungal strain differences or to the impact of ASP on other cells beyond DCs, such as basophils or epithelial cells, which in those experimental systems could contribute to Th2 polarization (70–72). Mechanisms involved in tolerogenic properties of both ASP-DCs and subsequently generated suppressive T cells support the novelty of the described phenotype. In comparison with DEX-DCs, ASP-DCs induce a similar upregulation of GILZ, but signaling pathways involved are distinct. Moreover, NF-κB inhibition is linked to p65 degradation in ASP-DCs only. ASP-DCs also upregulate both RALDH-1 and RALDH-2, two enzymes responsible for the conversion of vitamin A to retinoic acid. This latter metabolite has been described as a crucial inducer of FOXP3+ and IL-10–secreting Tregs (64, 73). Noteworthy, none of the latter molecules were found in CD4+ T cells cocultured with ASP-DCs, indicating that other regulatory mechanisms are involved. ILT4 could contribute to the tolerogenic effect of ASP-DCs following interaction with HLA-G as reported for IL-10–DCs (4). Although both treatments induce anergic T cells (74, 75), generated cells are different because only IL-10 DCs induce bona fide Tr1s (4). ILT3 and CCL-22 are specifically downregulated in ASP-DCs but not DEX-DCs. Similarly, DCs treated with vitamin D receptor agonists are distinct, because they upregulate ILT3 and IL-10, induce CD4+ FOXP3+ suppressive T cells, and enhance the production of the CCL-22 chemokine recruiting Tregs (76). Altogether, our work points to a new, potentially important, pathway to induce tolerogenic anergizing DCs. This pathway may be used in vivo by fungi for subverting the immune system and inducing a state of unresponsiveness. ASP treatment could also be of clinical interest to specifically downregulate unwanted immune responses and establish tolerance in transplantation, autoimmunity, or allergy. This work was supported by Stallergenes. A.Z. was supported by a Convention Industrielle de Formation par la Recherche fellowship from the Association Nationale de la Recherche et de la Technologie.
. 2007. Stimulation of the intracellular bacterial sensor NOD2 programs dendritic cells to promote interleukin-17 production in human memory T cells. Immunity 27: 660–669.
. 2002. Microbial compounds selectively induce Th1 cell-promoting or Th2 cell-promoting dendritic cells in vitro with diverse th cell-polarizing signals. J. Immunol. 168: 1704–1709.
. 2009. Tolerogenic signals delivered by dendritic cells to T cells through a galectin-1-driven immunoregulatory circuit involving interleukin 27 and interleukin 10. Nat. Immunol. 10: 981–991.
. 2004. Pharmacological induction of tolerogenic dendritic cells and regulatory T cells. Semin. Immunol. 16: 127–134.
. 2010. Programming dendritic cells to induce T(H)2 and tolerogenic responses. Nat. Immunol. 11: 647–655.
. 2009. Regulatory T cells (Treg) in rheumatoid arthritis. Joint Bone Spine 76: 10–14.
. 2004. Ex vivo selection of recipient-type alloantigen-specific CD4(+)CD25(+) immunoregulatory T cells for the control of graft-versus-host disease after allogeneic hematopoietic stem-cell transplantation. Transplantation 77(1 Suppl): S32–S34.
. 2010. Pharmacological modification of dendritic cells to promote their tolerogenicity in transplantation. Methods Mol. Biol. 595: 135–148.
. 2009. First-in-man clinical results of the treatment of patients with graft versus host disease with human ex vivo expanded CD4+CD25+CD127- T regulatory cells. Clin. Immunol. 133: 22–26.
. 2010. Role of Treg in immune regulation of allergic diseases. Eur. J. Immunol. 40: 1232–1240.
. 2007. Sublingual immunotherapy induces IL-10-producing T regulatory cells, allergen-specific T-cell tolerance, and immune deviation. J. Allergy Clin. Immunol. 120: 707–713. 2010. Dendritic cells in tolerance induction for the treatment of autoimmune diseases. Eur. J. Immunol. 40: 2119–2123.
. 2008. Dexamethasone transforms lipopolysaccharide-stimulated human blood myeloid dendritic cells into myeloid dendritic cells that prime interleukin-10 production in T cells. Immunology 125: 91–100.
. 2009. Induction of Treg by monocyte-derived DC modulated by vitamin D3 or dexamethasone: differential role for PD-L1. Eur. J. Immunol. 39: 3147–3159.
. 2009. Phenotypic and functional markers for 1alpha,25-dihydroxyvitamin D(3)-modified regulatory dendritic cells. Clin. Exp. Immunol. 157: 48–59.
. 2000. The effect of calcineurin inhibitors and corticosteroids on the differentiation of human dendritic cells. Eur. J. Immunol. 30: 1807–1812.
. 2005. Dexamethasone induces IL-10-producing monocyte-derived dendritic cells with durable immaturity. Scand. J. Immunol. 62: 45–54.
. 2006. Dendritic cells activated by lipopolysaccharide after dexamethasone treatment induce donor-specific allograft hyporesponsiveness. Transplantation 81: 1451–1459.
. 2006. 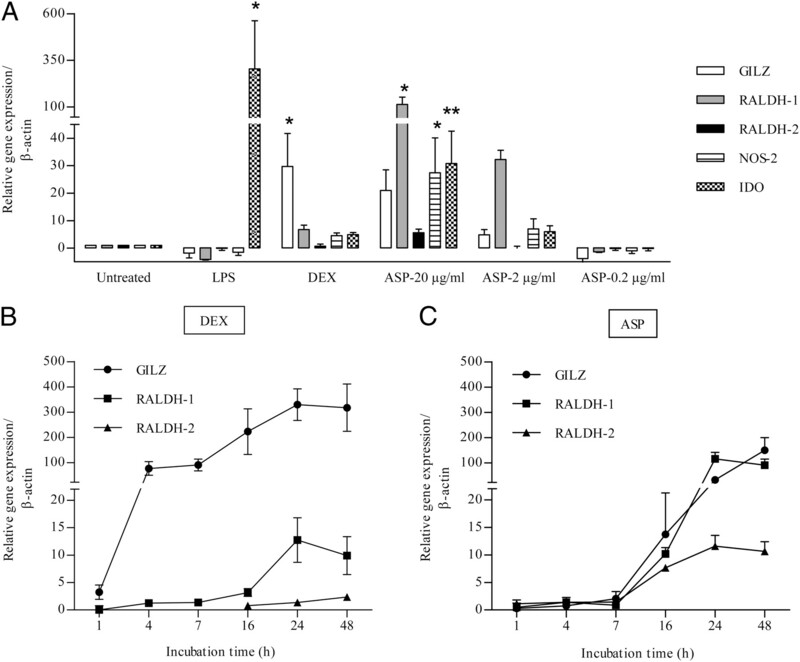 Effects of dexamethazone on LPS-induced activationand migration of mouse dendritic cells revealed by a genome-wide transcriptional analysis. Eur. J. Immunol. 36: 1504–1515.
. 2003. Prolongation of skin graft survival by modulation of the alloimmune response with alternatively activated dendritic cells. Transplantation 76: 1608–1615.
. 2003. High expression of ILT3 and ILT4 is a general feature of tolerogenic dendritic cells. Transpl. Immunol. 11: 245–258.
. 2002. Tolerization of dendritic cells by T(S) cells: the crucial role of inhibitory receptors ILT3 and ILT4. Nat. Immunol. 3: 237–243.
. 2008. Niflumic acid renders dendritic cells tolerogenic and up-regulates inhibitory molecules ILT3 and ILT4. Int. Immunopharmacol. 8: 997–1005.
. 2009. Induction of ILT expression on nonprofessional antigen presenting cells: Clinical applications. Hum. Immunol. 70: 357–359.
. 2010. Membrane and soluble ILT3 are critical to the generation of T suppressor cells and induction of immunological tolerance. Int. Rev. Immunol. 29: 119–132.
. 2009. Tryptophan deprivation induces inhibitory receptors ILT3 and ILT4 on dendritic cells favoring the induction of human CD4+CD25+ Foxp3+ T regulatory cells. J. Immunol. 183: 145–154.
. 2007. Induction of antigen-specific regulatory T lymphocytes by human dendritic cells expressing the glucocorticoid-induced leucine zipper. Blood 110: 211–219.
. 2001. Modulation of T-cell activation by the glucocorticoid-induced leucine zipper factor via inhibition of nuclear factor kappaB. Blood 98: 743–753.
. 2007. A functionally specialized population of mucosal CD103+ DCs induces Foxp3+ regulatory T cells via a TGF-beta and retinoic acid-dependent mechanism. J. Exp. Med. 204: 1757–1764.
. 2003. Retinoids regulate survival and antigen presentation by immature dendritic cells. J. Exp. Med. 198: 623–634.
. 2009. Retinoic acid-dependent regulation of immune responses by dendritic cells and macrophages. Semin. Immunol. 21: 22–27.
. 2010. Skin-draining lymph nodes contain dermis-derived CD103(-) dendritic cells that constitutively produce retinoic acid and induce Foxp3(+) regulatory T cells. Blood 115: 1958–1968.
. 2006. Regulatory T cells can mediate their function through the stimulation of APCs to produce immunosuppressive nitric oxide. J. Immunol. 176: 3449–3460.
. 1995. Production of neutral protease by membrane-surface liquid culture of Aspergillus oryzae IAM2704. J. Ferment. Bioeng. 80: 35–40.
. 1999. Simple chemicals can induce maturation and apoptosis of dendritic cells. Immunology 98: 481–490.
. 2009. TGF-beta1 dampens the susceptibility of dendritic cells to environmental stimulation, leading to the requirement for danger signals for activation. Immunology 126: 485–499.
. 2004. GILZ, a new target for the transcription factor FoxO3, protects T lymphocytes from interleukin-2 withdrawal-induced apoptosis. Blood 104: 215–223.
. 2010. Uptake of apoptotic DC converts immature DC into tolerogenic DC, which induce differentiation of Foxp3+ regulatory T cells. Eur. J. Immunol. 40: 1022–1035.
. 2010. Dendritic cell apoptosis: regulation of tolerance versus immunity. J. Immunol. 185: 795–802.
. 2008. Cutting edge: Autocrine TGF-beta sustains default tolerogenesis by IDO-competent dendritic cells. J. Immunol. 181: 5194–5198.
. 2002. CD4(+) and CD8(+) anergic T cells induced by interleukin-10-treated human dendritic cells display antigen-specific suppressor activity. Blood 99: 2468–2476. 2009. Generating tolerogenic dendritic cells with neuropeptides. Hum. Immunol. 70: 300–307.
. 2009. Induction of alloantigen-specific human T regulatory cells by vasoactive intestinal peptide. J. Immunol. 183: 4346–4359.
. 2004. Generation of tolerogenic dendritic cells by treatment with mitomycin C: inhibition of allogeneic T-cell response is mediated by downregulation of ICAM-1, CD80, and CD86. Transplantation 77: 1761–1764.
. 2010. A versatile role of mammalian target of rapamycin in human dendritic cell function and differentiation. J. Immunol. 185: 3919–3931.
. 2009. 1,25-dihydroxyvitamin D3 is an autonomous regulator of the transcriptional changes leading to a tolerogenic dendritic cell phenotype. J. Immunol. 182: 2074–2083.
. 2008. Dendritic cells genetically engineered to express IL-10 induce long-lasting antigen-specific tolerance in experimental asthma. J. Immunol. 181: 7230–7242.
. 2000. Synergy in induction of increased renal allograft survival after portal vein infusion of dendritic cells transduced to express TGFbeta and IL-10, along with administration of CHO cells expressing the regulatory molecule OX-2. Clin. Immunol. 95: 182–189.
. 2006. Induction of allospecific tolerance by immature dendritic cells genetically modified to express soluble TNF receptor. J. Immunol. 177: 2175–2185.
. 2005. Creation of tolerogenic human dendritic cells via intracellular CTLA4: a novel strategy with potential in clinical immunosuppression. Blood 106: 2936–2943.
. 2010. DC expressing transgene Foxp3 are regulatory APC. Eur. J. Immunol. 40: 480–493.
. 2005. Dendritic cells genetically engineered with adenoviral vector encoding dnIKK2 induce the formation of potent CD4+ T-regulatory cells. Transplantation 79: 1056–1061.
. 2006. Toward the identification of a tolerogenic signature in IDO-competent dendritic cells. Blood 107: 2846–2854.
. 2004. IDO expression by dendritic cells: tolerance and tryptophan catabolism. Nat. Rev. Immunol. 4: 762–774.
. 2002. Potential regulatory function of human dendritic cells expressing indoleamine 2,3-dioxygenase. Science 297: 1867–1870.
. 2009. Co-operative action of interleukin-10 and interferon-gamma to regulate dendritic cell functions. Immunology 127: 345–353.
. 2007. Nitric oxide and indoleamine 2,3-dioxygenase mediate CTLA4Ig-induced survival in heart allografts in rats. Transplantation 84: 1060–1063.
. 2008. Retinoic acid increases Foxp3+ regulatory T cells and inhibits development of Th17 cells by enhancing TGF-beta-driven Smad3 signaling and inhibiting IL-6 and IL-23 receptor expression. J. Immunol. 181: 2277–2284.
. 2006. Immunity and tolerance to Aspergillus involve functionally distinct regulatory T cells and tryptophan catabolism. J. Immunol. 176: 1712–1723.
. 2009. Immune sensing of Aspergillus fumigatus proteins, glycolipids, and polysaccharides and the impact on Th immunity and vaccination. J. Immunol. 183: 2407–2414.
. 2010. Aspergillus fumigatus regulates mite allergen-pulsed dendritic cells in the development of asthma. Clin. Exp. Allergy 40: 1507–1515.
. 2008. Fungal proteases induce Th2 polarization through limited dendritic cell maturation and reduced production of IL-12. J. Immunol. 180: 6000–6009.
. 2002. A protease-activated pathway underlying Th cell type 2 activation and allergic lung disease. J. Immunol. 169: 5904–5911.
. 2003. Basophils express a type 2 cytokine profile on exposure to proteases from helminths and house dust mites. J. Leukoc. Biol. 73: 165–171.
. 2009. Proteases induce production of thymic stromal lymphopoietin by airway epithelial cells through protease-activated receptor-2. J. Immunol. 183: 1427–1434.
. 2009. Contrasting roles for all-trans retinoic acid in TGF-beta-mediated induction of Foxp3 and Il10 genes in developing regulatory T cells. J. Exp. Med. 206: 343–357.
. 2007. Mechanisms of prolongation of allograft survival by HLA-G/ILT4-modified dendritic cells. Hum. Immunol. 68: 264–271.
. 2005. Tolerization of dendritic cells by HLA-G. Eur. J. Immunol. 35: 1133–1142.
. 2009. Dendritic cell tolerogenicity: a key mechanism in immunomodulation by vitamin D receptor agonists. Hum. Immunol. 70: 345–352.